The Noyo Headlands Unified Design Group endeavors to foster the planning and implementation of an integrative and viable natural restoration of the Georgia Pacific mill site in Fort Bragg, California. Following the Hanover Principles, which includes creating long term value, eliminating waste and relying on natural energy flows, the group is dedicated to creating a diverse, multi-use public/private project to serve as a model development for communities around the world. This video is by Emerald Globe. If our entire community gets behind this vision, while the clean-up is still under way and crucial decisions remain ahead, it will be irresistible. 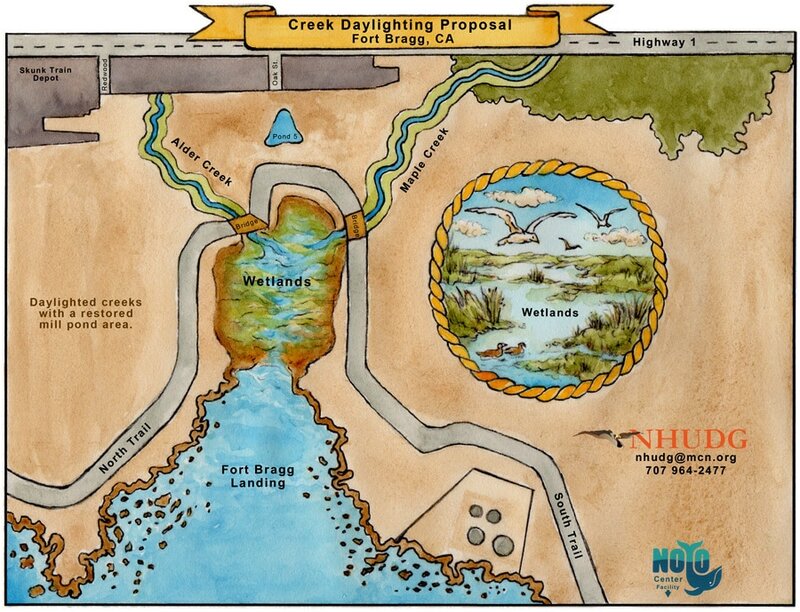 Below we have a vision of how the daylighted creeks will look someday. With a thorough clean-up of the toxic old mill pond, Fort Bragg can get close to the historic pathways of Maple and Alder creek. When we get rid of the old berm we can begin the process of establishing an estuary in the low lying area. This is needed to prepare for sea level rise and coastal adaptation. This restored natural feature will enhance every aspect of the Headlands and sequester carbon. DTSC's Community Update May 2018 is linked below.